This is a Christian devotional guide for short-term use, perhaps during November or during Lent. Its purpose is to intentionally concentrate on God’s Providence, his daily care for us through a variety of life’s experiences. Each day’s entry includes a short biographical paragraph, scripture, prayer, a journal, and an album, as well as additional scripture on each day’s emphasis. It is hoped that living with an attitude of gratitude becomes a rich benefit from using this devotional guide, especially in times when so many negatives seem to combat us through the media and those who see doom and gloom. We are to live life abundantly, and this book will help us focus on God’s Providence and Sovereignty. 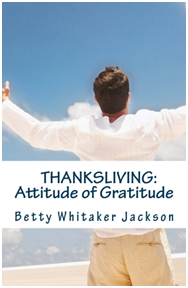 A perfect gift for family members, and use in women’s care ministry, Thanksliving: Attitude of Gratitude is an encouragement to those who use it.